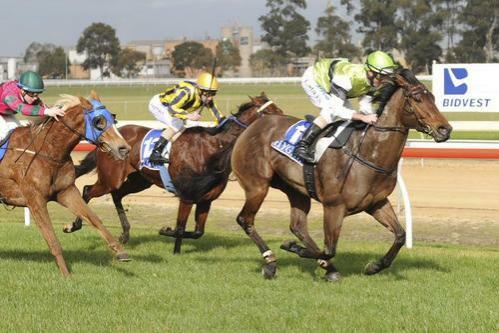 It was profitable weekend for followers of the Delbridge Racing newsletter with the win of Art and Whiskey at Sale on Sunday 21st July 2013. Those who followed our “tip” were rewarded with a 2 length win by Art and Whiskey coming from well back in the field to storm home for a great win. He paid $17.50 for the win on the Supertab!!!!!! It was a great win by this impressive sprinter and Art and Whiskey (pictured) seems to be improving as he matures. He has pulled up well and will be kept fresh for his next run likely to be in 3-4 weeks’ time. So put him in your “black book” and follow his exciting come from behind barnstorming finishes. To join the winning team go to http://delbridgeracing.com.au/horses-available for quality ownership opportunities at good value prices.